Sparkle Coin, Inc., designed to be the most transactable cryptocurrency available, is launching its initial coin offering (ICO) at 1 p.m. PDT September 20 and running through October 20, 2017 with coins beginning at $5. A LIVE STREAMING event will start at 12 p.m. PDT at TechCrunch SF. SAN FRANCISCO, Calif. /Mortgage and Finance News/ — Sparkle Coin, Inc., designed to be the most transactable cryptocurrency available, is launching its initial coin offering (ICO) at 1 p.m. PDT September 20 and running through October 20, 2017 with coins beginning at $5. A LIVE STREAMING event will start at 12 p.m. PDT at TechCrunch SF. Interested parties are encouraged to set up their pre-funding accounts in advance at https://app.sparklecoin.com/Home/IcoLanding to purchase Sparkle Coins as soon as they are available. Sparkle Coin(TM) will be a part of a new economic ecosphere, which includes a currency exchange, payment gateway software and online shopping mall. 1. Driving rapid increases in demand by allowing online shoppers to use their Sparkle Coins to purchase products directly from their favorite online stores. 2. Maximizing liquidity through a powerful currency exchange enabling trading with other cryptocurrencies and fiat currencies, as well as free payment gateway software that easily integrates into any e-tailer’s website(s) with a few clicks. After the ICO, online shoppers can use their Sparkle Coins, as well as other cryptocurrencies, to purchase products directly from their favorite online stores — including Amazon, Walmart, Target, Toys R Us, Bed Bath & Beyond, Staples and more — via VCoinMall.com, a peer-to-peer e-tailer which connects customers with retailers and other e-tailers. Sparkle Coins can be transacted on VCoin Exchange, a currency exchange that allows for trading with other cryptocurrencies and fiat currencies. VCoin Exchange also provides free payment gateway software in the form of easy to download plugins, allowing virtually any merchant to accept Sparkle Coin and other cryptocurrencies as payment. “With the economic ecosphere that we have created, Sparkle Coin bridges the gap between cryptocurrencies and everyday commerce,” said Victor Wong, founder and CEO. “Sparkle Coin allows users to make purchases from popular online retailers, and it can easily be exchanged for other currencies – two major barriers that have previously hindered the wide-spread adoption of cryptocurrencies. The Sparkle Coin ICO will be conducted using a new, more efficient patent-pending method of ICO. The coins will be divided into 80 blocks of 50,000 coins each, with first block starting at $5 per coin. Rather than releasing all the coins at the same cost each subsequent block increases by $2 per coin, allowing buyers to employ various strategies when buying Sparkle Coins and letting supply and demand dictate the price of the coins. Providing 80 checkout options rather than one single checkout helps manage any potential purchasing delays. Sparkle Coin is a hybrid cryptocurrency possessing the best qualities of both PoW (Proof of Work) and PoS (Proof of Stake), providing rapid adoption through mining of Sparkle Coin as well as long-term sustainability through minting. Sparkle Coin’s hybrid PoW and PoS algorithm is the latest technology for cryptocurrency, providing a rapid ramp up of miners and subsequently processing power for the network to create extremely powerful encryption and security, and accelerated transaction processing. Sparkle Coin, Inc. is a managed cryptocurrency company founded by business and technology veterans to rapidly increase adoption of and promote long-term sustainability of cryptocurrencies for real-world business transactions through a new economic ecosphere including Sparkle Coin, the most transactable cryptocurrency available; VCoin Exchange, a powerful currency exchange and exclusive payment gateway for millions of online retailers to accept cryptocurrency; and VCoin Mall, an online marketplace that connects consumers with major online e-tailers. Sparkle Coin is a hybrid of PoW (Proof of Work) and PoS (Proof of Stake) software, providing rapid adoption through mining of Sparkle Coin, as well as long-term sustainability through minting. 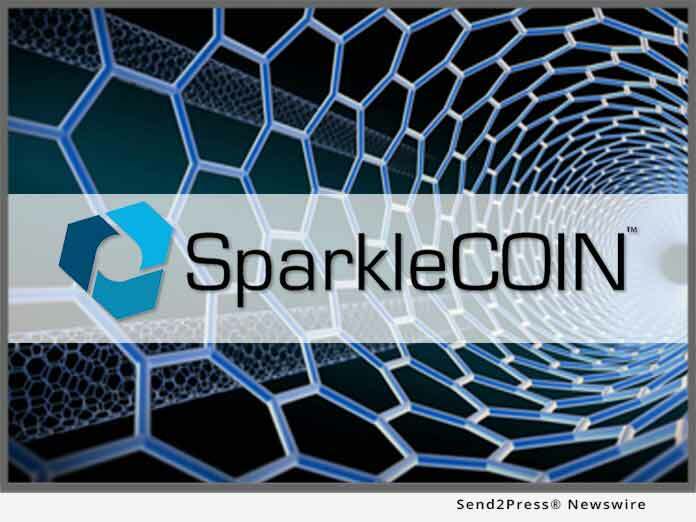 For more information, visit https://sparklecoin.com/.